Priscilla Mary Isin The author contributed a piece to PPC 61 on the nineteenth-century Turkish cookery book by Mahmud Nedim bin Tosun. Here, she introduces a very early German text describing Turkish confectionery. A remarkable source of information about the inadequately researched area of Turkish confectionery is an account by a professional confectioner who pursued his investigations in Greece and Turkey in the 1830s. Friedrich Unger was Hofconditor or Chief Confectioner to King Otto I who, as a young Bavarian prince of just seventeen, was appointed the first King of Greece by the European powers in 1832, three years after that country won its independence from Turkey. Unger, who accompanied Otto’s German household first to Nauplia and then to Athens, was intrigued by the legendary reputation of oriental confectionery and ‘missed no opportunity wherever it arose’ to investigate it for himself, but was advised that Istanbul was the place to find Oriental confectionery par excellence. In the summer of 1835, pleading ill health, Unger was granted leave of absence and sailed to Istanbul, where his researches into various branches of the confectioner’s trade included a visit to the confectionery kitchens at Topkapi Palace. He wrote his book in Athens in 1837, and the results of his ‘researches over five years’ were published in 1838. An abridged Turkish translation of Unger’s Confectionery of the Orient was published around 1987 by the Konya Cultural and Tourism Association, but so much was left out (including six colour plates) and so many problems of terminology were left undealt with, that I resolved to track down the German original. I failed to do so, however, for several years until the Internet came to the rescue, revealing a copy in the Bayerische Staatsbibliothek, which supplied a microfilm. Merete Çakmak translated the book into English, while I undertook the background research and annotation. The first part of Unger’s book is devoted to descriptions of confectionery and confectioners’ shops in Greece and Turkey, the Turkish confectioners’ guilds (for which he quotes from Joseph von Hammer’s Constantinopolis und der Bosphoros published in 1822), and his visit to the imperial confectionery kitchen at Topkapi Palace. The confectioner’s shop in Nauplia which was recommended to him as ‘the best and most acclaimed in all of Greece’, sold candied fruit, pulled sugar, dragées, tragacanth sweets, fruit preserves and a range of beverages – coffee, chocolate, punch, lemonade and almond milk. However, he was disappointed to find ‘nothing worth introducing at home’, and it was in hope of doing so that he travelled to Istanbul. In that city he visits both confectionery and helva shops, the former also concocting fruit sherbets. He describes the charcoal cookers and utensils of the confectionery kitchen at Topkapi Palace which was by this time no longer inhabited by the Sultan, so he was only able to see ‘kitchen hands busy preparing a large amount of coarse sesame helva for the servants’. Moreover, the chief palace confectioner was reluctant to answer the questions put by Unger, who later obtained detailed information from ‘a Greek confectioner who had worked for a long time in the Imperial Sugar Bakery.’ He next describes street vendors of sweets, salep, sesame helva, and iced water mixed with grape syrup. In his concluding remarks to this section, Unger says that although the oriental origin of many items of confectionery produced in Europe, ‘especially preserves, pulled sugar, aromatic water, etc. cannot be denied… what we have learned from the Orientals we have further developed and brought to greater perfection.’ He goes on to admit that among the confectionery he has observed some that ‘could be new articles for our confectioners’ shops’. Others, he says, ‘because of their dull or overwhelming flavour are difficult for our delicate palates to accept,’ or difficult to imitate because their ‘ingredients either cannot be found or only at great expense’. Unger does not specify which of the 97 recipes (discounting those for eight miscellaneous items which cannot be classified as confectionery, such as yogurt, salep, Turkish coffee and incense tablets) belong to which of these categories. The second part of the book is devoted to recipes, generally titled by the original, mostly Turkish, names: 34 fruit preserves, 29 sherbets, 11 helvas, 2 toffee-like sweets with sesame and chickpeas, 4 Turkish delight, 8 miscellaneous candies, and 9 sweet pastries. The recipes are often disappointingly brief, however, and frequently omit essential details, either because Unger had the same sense of professional secrecy that presumably motivated the chief palace confectioner, and was reluctant to publicize information that he himself might want to use in future; or alternatively because he was not able to gather as much detail as he claimed. 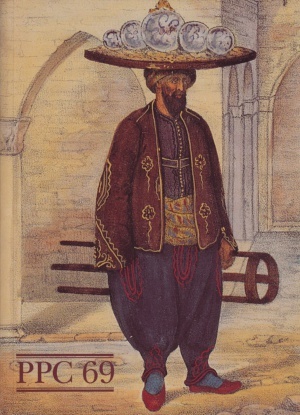 A case in point is his recipe for Keten Helvasi, a type of candy floss, which is still produced by commercial confectioners in two main types (pi,smaniye and saray helvasi, both of which can be purchased in shops and even supermarkets in Turkey today), and in the past was also made at home at social gatherings known as helva parties. When Unger’s recipe is compared to Turkish recipes, which average a close page or more of detailed instructions, Unger’s single cryptic paragraph proves completely unusable and even misleading. On the other hand there are descriptions of sweetmeats of which no trace – even dictionary definitions – seems to have survived. Brief as they may be, these are valuable sources for food historians. Unger refers again to secrecy in his account of dragées, although his sardonic comments imply they were hardly worth learning about anyway, dismissing them with: ‘Under this name you find cinnamon, cloves, almonds, pistachios and sesame seeds coated with different colours in large quantities, but prepared in such a way that one has never seen a worse dragée; yet the Orientals have no small opinion of their cauldron work and only with the greatest flattery on my part could I discover the secrets.’ The poor quality of dragées may perhaps indicate that these were not a traditional Turkish confection, but borrowed from Europe. The fact that European attempts to imitate such celebrated Turkish sweets as Turkish delight (earlier described in English as ‘lumps of delight’), tasting of which was on the itinerary of every nineteenth-century tourist to Istanbul, were always unsatisfactory, shows that even when the ingredients and basic method were known, certain crucial technical details proved elusive. Turkish delight was being exported in large quantities to Marseilles at the end of the nineteenth century, according to the French painter and mosaic artist Pretaxtat Lecomte, who worked in Istanbul for several years and made a study of Turkish arts and crafts. Lecomte explains, ‘As for handling, it must be very skilful and very meticulous. It is in that which lies all the secret, and it should not be assumed that this is a minor matter, which is why no one in Europe has ever succeeded in imitating locoum.’ One knotty but engrossing problem with the translation of Unger’s text has been the identity of what Unger calls cedrate. This is comparable to the mystery surrounding the identity of helva root (see the fascinating discussion of this in PPC 47, 48 and 49). Although all the modern authorities I consulted assured me that cedrate is the citron, in the past this does not seem to have been the case. Citrons and cedrates are referred to separately by d’Ohsson, writing in the late eighteenth century, for instance. Other evidence for and against is complex, inconsistent, and so far inconclusive. It is not helped either by Unger’s own confusion, which was what aroused my doubts about the identification in the first place. To cut a long and interesting story short, I tend to the conclusion that cedrate was the bergamot orange, a fruitful idea for which I am indebted to Ottoman historian Joyce Matthews. Any comments and information by PPC readers on this subject will be gratefully received. Another mystery ingredient is salbey, which in every German dictionary, ancient and modern, we have consulted means sage, but is evidently no such thing in Unger’s recipe for salbey jam. The Latin term which Unger gives has also proved a dead end, although the other scientific names he gives are accurate. Our two candidates for this are tamarind or carob, on the fragile evidence of Unger’s ‘berry-beans’. Here follows this recipe, which is also a good example of Unger’s cryptic instructions: Salbey Preserve Pick the berry-beans off the salbey (fuska milla) in May, and blanch them in lye. Put clean lye on the fire, and when hot toss in the salbey berries and take the pan off the fire so that they do not dissolve. Then peel off the husks and place them in fresh water. Now leave them in clarified syrup until it becomes smooth, which will take approximately 4-6 days. There are also recipes for luhuk ,serbet, an item that seems to have died out in Turkey today, but was evidently a type of fondant which was not yet known in European confectionery. According to Laura Mason’s article on fondant in Davidson’s Oxford Companion to Food, ‘It appears to have originated in the middle of the 19th century, probably in France.’ The German term tabliren which Unger uses for ‘working’ the sugar in these recipes and which he feels the need to define to his readers as ‘rubbing’, is still used in modern German recipes for fondant. The possibility that fondant was introduced to Europe from Turkey is worth further investigation. Here I quote the first of these recipes, which is of unusual length and detail: Lohuk Scherbet with Orange Water Boil approximately 3/4 occa of sugar to a feathered syrup. As soon as you take it from the fire, add 1/4–1/2 liquor glass of lemon juice. This is required for every lohuk scherbet. Stand the pan in the water until it has cooled down a bit, and work the syrup until it starts to thicken, then pour in sufficient orange water that the sherbet when poured does not become firm, but soft and similar to a pomade. The Turks themselves quite often prepare fairly large quantities in the street in front of their shops, in great tinned pans. They work and stir the syrup with a great spatula with such dexterity that it is evident they often prepare it. They also quite often place the pan on ice rather than in cold water so that the sugar cools more quickly and the scherbet becomes more delicate and fine. As already mentioned, they make it somewhat softer in winter than in summer because the softer lohuk scherbet ferments more easily in the great summer heat. This softness is brought about by adding the liquid parts of the ingredient that lends its name to it; i.e. to orange scherbet is added orange water, to fruit scherbet fruit juice, while to other scherbets made with scented oils one adds clean water. To conclude, I have chosen one last recipe, again a detailed example, for peynir ,sekeri, which is an old-fashioned sweet interesting on account of its close similarity to Edinburgh rock, having the same chalky texture. Until a few years ago these white sweets were common in Turkish sweet shops, but have now, like so many others, been dealt a mortal blow by chocolate bars. Peinir schekeri (pulled sugar) This confection, so well known in Europe as pulled or king’s sugar, also called Spermazett, is consumed in great quantities in the Orient and represents the main ingredient of the sweet goods of each schekerdschian (sugar baker). This pulled sugar the Turk produces with great dexterity and during the preparation lends to them all imaginable varieties of colours and shapes. The writer of this work found often next to the shop of the schekerdschian a large marble slab, and up on the wall a great hook. In order for the sugar not to harden too soon he uses a pan of charcoal embers. There is no difference between the method of preparation used here and the European. The Turk boils a quantity of sugar to cracking point, adds some lemon juice, so that is does not grain too quickly and is more malleable, colours it or leaves it white, pours it on the slab, pulls the sugar over the hook until it is finished, and then gives it different shapes. He prepares Peinir Schekeri of a white colour with vanilla pods, of a red colour with rose oil, yellow with orange oil, and with cinnamon oil etc. etc.